Being a lifelong Nikon user, it always feels like an uphill battle against the superior range of ready-made accessories for astrophotography with a Canon. 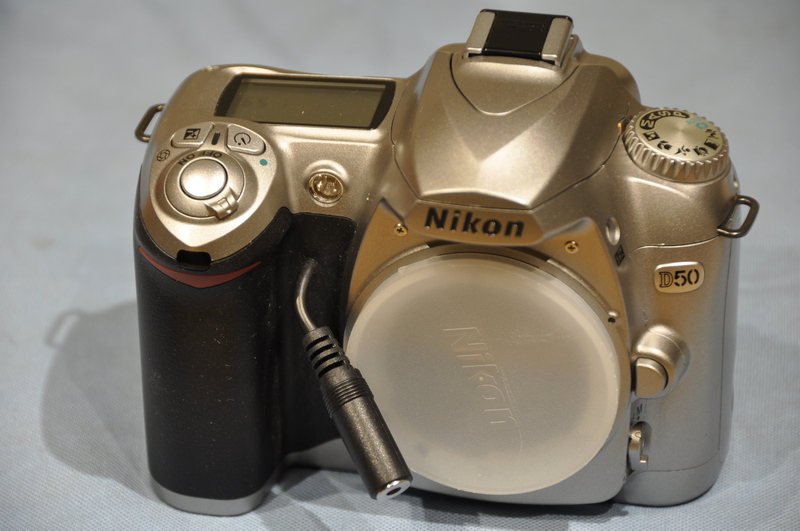 The Nikon D50, however, now goes for about fifty quid on eBay, and it has some of the biggest pixels available on an APS-C sensor. Bigger pixels catch more photons from the night sky, and DSLR sensors generate electrical signals based on photon counts. 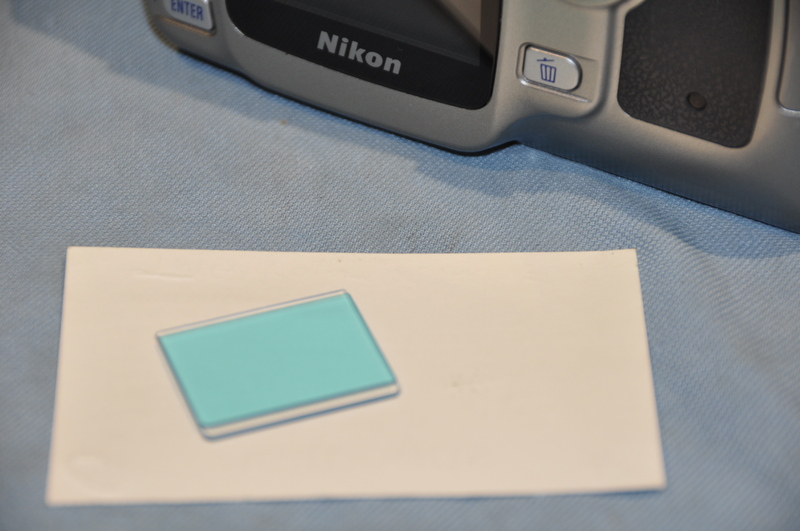 The D50 has 6.1MP, each 7.8μm square, individually twice the size of the 5.5μm square of my 12.3MP D90. I took the camera to bits when it arrived, stripping it right down to remove the UV/IR filter from in front of the sensor. The filter is built into every DSLR, rendering it insensitive to light outside the visible spectrum (UV and IR) which would ruin normal photos. Astrophotos, however, need to capture the red-glowing nebulosity just outside the visible range – hence the filter removal commonly known as astro-modification. With only a slight variation, I followed the very clear instructions here. These are uncharted waters for me, so we’ll see what happens. The D50 uses SD cards, so no new kit needed there. Unfortunately the D50 has no socket to attach the electronic equivalent of a cable release, so it’s out with the soldering iron and a small twist drill. Find the terminals under the shutter release button, solder in some wires, bring them out through the camera body and attach a 2.5mm jack socket. Convert the end of my existing interval timer (eBay again, a fiver) to a jack plug. Full testing will have to wait a while, but I’ll update this post as the project develops. Watch this space! Not sure why I haven’t posted for a while, as there was a spell in April when we had a string of back-to-back clear nights. There were opportunities galore to capture springtime galaxies, and I found new locations such as Elterwater carpark to take advantage of dark skies. 17 April, with some cloud in the east, I headed to the centre of the Lake District in pursuit of “Markarian’s Chain” using my new protocol of guided 10-minute exposures. Elterwater is a small village in the Langdale valley, but has a good accessible hard standing carpark where I set up my system. The netbook computer guides for only a couple of hours on its old battery, so once it’s up and running I have to get on with it. The target was Markarian’s Chain of galaxies just east of Leo, and I managed six frames of 10 minutes each before the clouds chased me down. 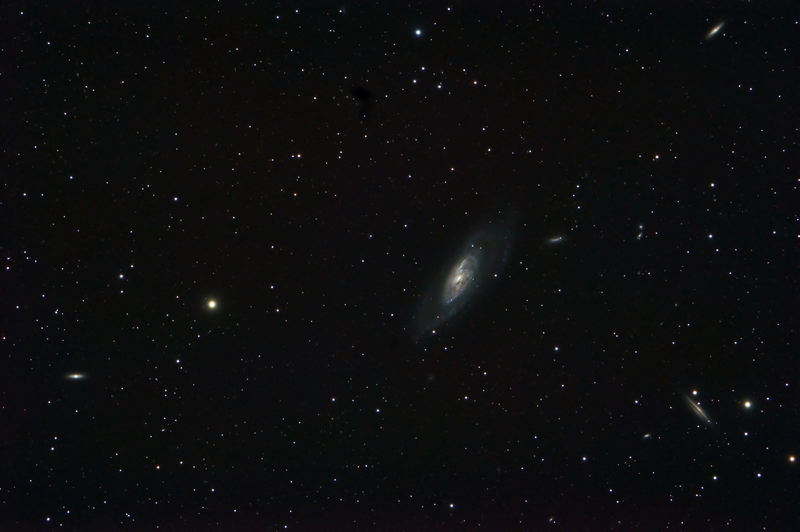 One frame was a little hazy, so the result is a stack of 5×10 minutes. Darkness was good, but disadvantages of Elterwater include some very bright outside lights on tourist rental properties, and large camper vans using the carpark for overnight stays. Also it is low altitude and a bit of a bowl for mist and condensation. That said, there are 25 or more galaxies easily seen in this photo, and the stats are mind-boggling. 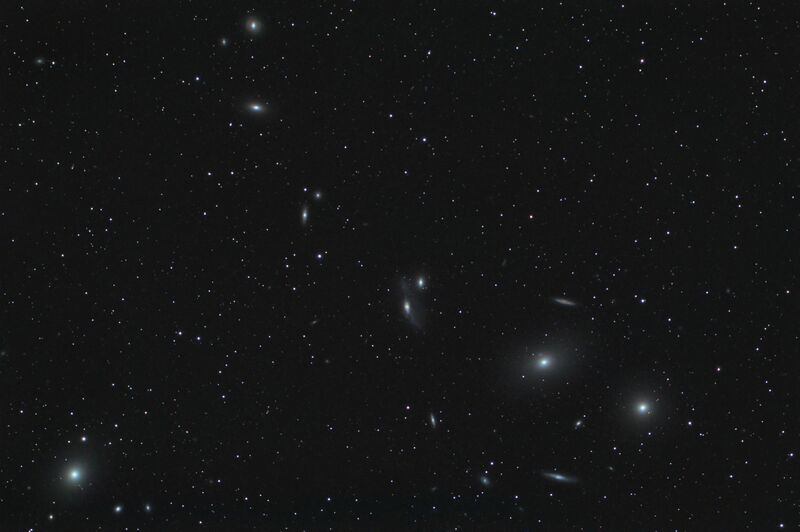 Most objects in this frame are over 50 million light years away, and the galaxy in the bottom left corner (M87) is a million light years from M84 at the right hand end of the chain. Galaxy NGC4388 at bottom right (the “smile” on the face at the front of the chain) is 11th magnitude, which makes it less than 1% of the brightness of the faintest object visible to the naked eye from a dark location. The galaxies are gravitationally bound to one another, despite the incomprehensible distances involved. All that with a Nikon D90! 50 minutes: 5 frames of 10 minutes each. 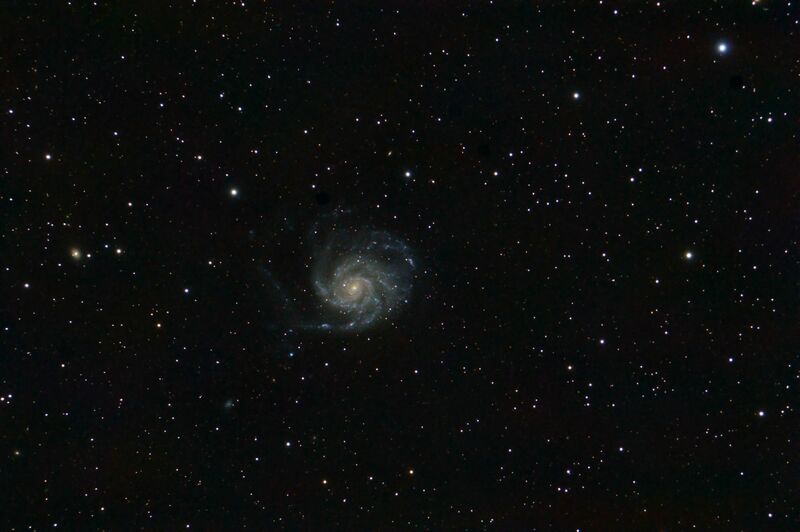 On the night of 18 April, M101 was at zenith, captured here in 9 frames guided at 10 minutes each. That’s a total of an hour and a half on one galaxy, which is a lot for me (until now!). 10 minutes is fantastic for light gathering, but pushes the boundaries of long exposure v potential for disturbance. If a car drives past, or if a strong gust of wind nudges the system – or even if the guiding software momentarily loses sight of the guide star – then the whole 10-minute frame is spoiled. These were taken in the long layby on the A591 outside Staveley, which is sheltered but by no means unused, and I was fortunate that there was almost no traffic that night. 90 minutes: 9 frames of 10 minutes each. On 21 April, I was back on the Shap Road with fellow members of the Eddington Astronomical Society, and my target this time was M106, again at zenith. Thirteen frames of 10 minutes were reduced to nine on closer inspection (gusts of wind spoiled four), so this is also a stack of 9×10 minutes. In calm conditions I seriously wonder whether the DSLR could cope with 15 minutes per frame; with the ISO at a comfortable 400, there is very little by way of glow from the sensor. What level of detail might be possible with three or four hours total exposure? Finally, on 26 April, a quick experiment from my own back yard. With high buildings and trees obstructing a clear view of the sky, it’s not possible to go through the star alignment process on the GOTO handset, so I’m restricted to polar-aligning the mount by eye. I hoped that with 5-minute frames, the guiding system might smooth out the alignment error. 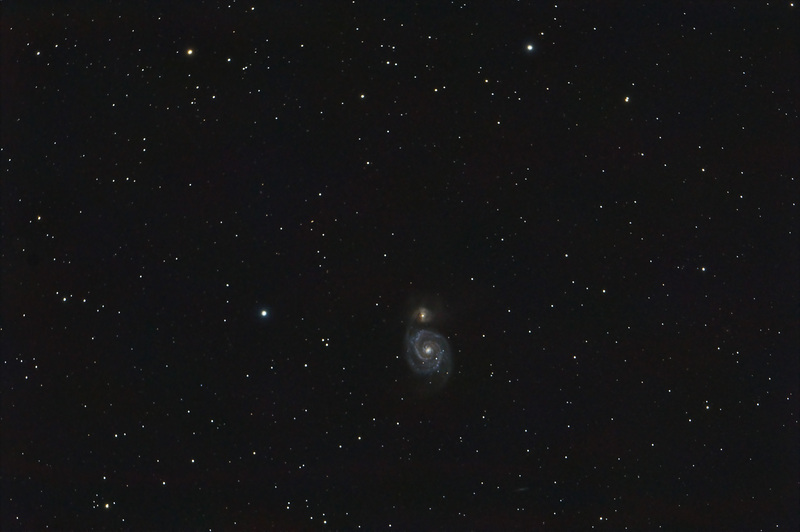 Here’s 20×5 minutes on M51, with the ISO wound up to 800, suggesting this has some promise. There’s light pollution from next door’s uncurtained landing window, so a light pollution filter might be a useful addition to the armoury. 100 minutes: 20 frames of 5 minutes each.